Since I started trying to improve my overall health and fitness I’ve been looking into vitamins and supplements and how and when they can complement your diet. It’s true that most people can get all of the vitamins and minerals they need by eating a balanced, varied diet. But this is not always easy, and often circumstances may prevent you from being able to achieve this on an every day basis. Researchers are finding that some vitamins and minerals that are protective against disease do so in amounts that are difficult to obtain through diet alone; so there is some evidence that they can be beneficial for our health. However, taking too many supplements can be be bad, even toxic, for our health, so it’s important to read up on advice and always talk to your GP if you’re unsure. I have always bought my supplements from Healthspan in the past and even made a special visit to their shop when I was in Jersey. I take their Lipo Carn as I find it helps with digestion and stops bloating, and I also take their Peppermint Oil for the same reason. I used to also religiously take their Happy Days HTP tablets, which are a natural source of a substance that is converted into Serotonin in the body. When I was going through quite a ‘down’ period I found they made me feel much more able to cope with things and they even improved my sleep. They are also reported to help with migraines. 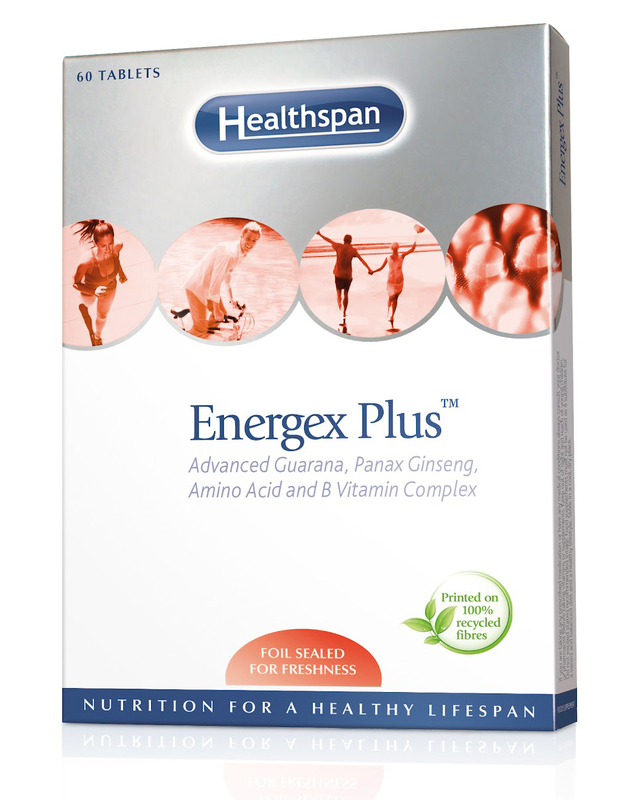 Because I love the brand so much I put myself forward to review one of their newer products; Energex Plus. Energex Plus has been designed to aid the strain that modern lifestyles put on our energy resources by providing a natural ‘pick me up’ that contains guarana, Panax ginseng, amino acids and the entire family of B vitamins. There is also 50mg of caffeine to give you a bit of ‘get up and go’. The idea is that you take them whenever you need a bit of a boost, and you can take either one or two tablets a day. I started using these a couple of weeks ago when I started walking the dog and running in the mornings. Because I have to get up at 6am to do this I usually awake feeling sluggish and still half asleep. I’ve been taking these as soon as I get up and they have me feeling raring to get out of the door. I don’t take them at weekends or on mornings I’m not running because I don’t feel I need them but they have become an invaluable part of my morning routine on my more active days. The caffeine in them is a lot less than a can of Red Bull so they don’t leave me feeling wired during the day or with difficulty sleeping, it just feels enough to get me round the run and then ready to start the day. I actually had a real panic when I thought I’d lost my second sheet the other day as until I build up my stamina and energy levels through doing more exercise I’ll be relying on these to get me out of bed and out of the door in the morning. You can also read more about my forays into running on the Where Are My Knees blog here. Energex Plus are available in a 60 tablet packet for £8.95 here. *I was sent this product to review, but all other Healthspan products referenced have been purchased with my own money.